Bitrix24 Now Works With OneDrive, Dropbox And Google Drive! First, changes are that your employees, clients or business partners are among hundreds of millions of people who store their files in the cloud, so it’s just a matter of convenience. Second, most folks use their personal accounts to store their data and this means no access rights, no company structure and no workflows. After you upload a file or files to Bitrix24, you’ll be automatically able to use it in your workflows with the default access rights. For example, if an employee from Marketing department uploads his or her file from a personal Dropbox account to Marketing group drive, the file automatically fall under access rights that are set for the drive or folder. As soon as the file is uploaded, it’s indexed by Bitrix24 search and can be found by those who have access rights to it. Finally, you can still work with your files inside Dropbox, OneDrive or Google Drive accounts, after you’ve uploaded them to Bitrix24. 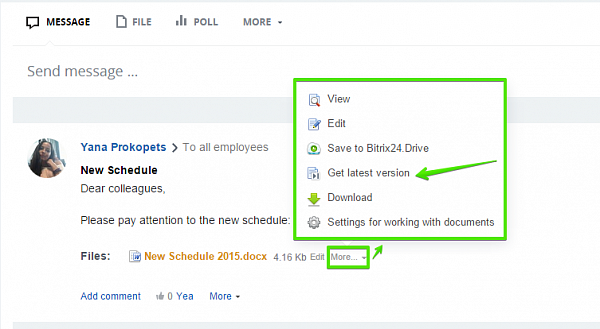 When you click “Get latest version”, Bitrix24 will compare the version of the uploaded document with the one stored in the external drive and, if necessary, upload a newer version to Bitrix24. Did Bitrix24 change your life? Tell us how. Workgroups. What are they and what are they for?